Although Y-DNA and mtDNA are potentially powerful tools in breaking through barriers that documents research is unable to dissolve, these tools only address a very small part of one’s total family tree. As researchers focus on earlier generations of their ancestors, the fraction of the preceeding generation these tools can help with plummets precipitously. While they can give a male information about both his parents, they return inform on half of his grandparents, one-fourth of his great-grandparents, one eight of his great-great-grandparents. You will recall from our discussion above that DNA samples provided by women yield information on only half that many ancestors. To help find information on all the grayed-out ancestors in the middle of the pedigree chart below, testing of autosomal DNA is being introduced to the public in 2010. Autosomal DNA certainly does not replace traditional methods of genealogical research. In fact quite the opposite is true. Those who have been involved in the beta tests of autosomal testing as it has been preparing for public launch have been motivate to renew their efforts at traditional genealogy in order to take advantage of the information uncovered in autosomal testing. If an autosomal match is found, additional information is needed to understand where this match connects to you in your family tree. 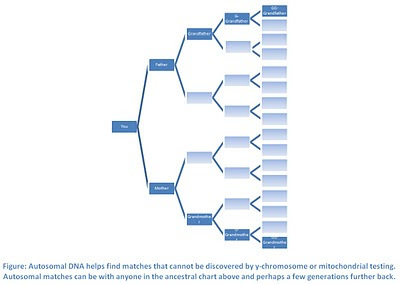 The match itself just tells you that you likely share some common ancestor with the other individual. The magnitude of the match will give you some idea how many generations back the match occurred. However, unless BOTH you and your matched relative have extensive documentation of your family histories, you are not likely to discover how you are related.